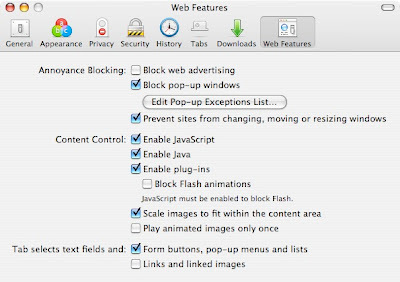 A New Mac Tip Every Day: A website that resizes your browser! There are a few things that I find really annoying when I browse the web and one of them is a website that changes the size of my browser to maximize it. Maximizing is in the Windows world, but I really don't want it in the Mac world. I don't mind too much when I am on my 13" laptop, but on my 23" ACD, maximizing a browser window is a total waste of space. There is a great option in Camino that solves this however (it doesn't look like it is available in Firefox or Safari). It is in Camino, and Preferences. From there, it is in the "Web Features" tab. It is called "Prevent sites from changing, moving or resizing windows". This simple option makes the web browsing experience so much more enjoyable. I totally agree, it's incredibly annoying to have my browser resized. Too bad the feature doesn't exist in Safari or Firefox. In fact I like mazimized windows :D Is there a way to do it intentionally? For maximising browser windows, store this as a bookmark in ur browser. I've never had a resized window in Safari. Perhaps windows with tabs won't resize, due to the other pages on one window? Question: How to take a video screenshot? Viewing a 360 degrees photo in QuickTime!